I suppose if you get your news in a funny-sounding language you need to work hard to really understand, what any politician says become much more palatable. You expect nonsense, so to speak. And there are other things to consider. My friends accuse me of being a bit of a Francophile. Yes. I am. All those visits to Paris would make it seem so, and right now I am smoking a pipe I picked up at Au Caïd. Au Caïd? See Heather-Stimmler Hall, who doesn't smoke, in her Secrets of Paris Newsletter: "Just to show I'm not biased, here's a smoke shop you should visit. Au Caïd is one of the oldest boutiques in St. Michel neighborhood, selling pipes, cigars and tobacco accessories for 120 years. Au Caïd 24, bd Saint-Michel, 6th 01-43-26-04-01." But Ric Erickson of MetropoleParis sent me an email a few months ago saying he thinks they've finally closed. Oh well. Be that as it may, I finally got around to reviewing the British magazines, being, I hope, even-handed. And what do I find? This in The Spectator, the Cover Story of 3 January 2004. This year is the centenary year of the Entente Cordiale, and I intend to celebrate it by buying a house in France (the acte authentique, the final signing, takes place later this month) and, in the not very distant future, by living there. Whether this will improve AngloFrench relations remains to be seen. It seems Ted is about to turn is back on the Anglo-American culture. So what's his reasoning? Is France such a fine place? No. France is no terrestrial paradise, but I know from experience of living abroad that other countrys blemishes do not affect you in the same way as your own countrys blemishes, which weigh heavily on your soul. You can observe the failings of foreign politicians with amusement and the intractability of foreign social problems with detachment. It is only when living abroad that Dr Johnsons dictum that public affairs vex no man, comes true - at least for me. So he's fed up with "public affairs." Aren't we all? Well, I suppose if you get your news in a funny-sounding language you need to work hard to really understand, what any politician says become much more palatable. You expect nonsense, so to speak. Is France in better shape than Britain? Its countryside is emptier, which for someone like me, who has had enough of crowds in general and people in particular to last him a lifetime, is good enough. I know it is a high-tax economy - bureaucratic and sclerotic in many respects - but at least the people seem to get something in return for their taxes. France's infrastructure, public transport and healthcare are far better than Britain's. It would be nice if we in Britain got something - anything - tolerably decent in return for our taxes, but with the increasing moral and intellectual corruption of our public services that I have seen over the years, and the unimpeded advance of willful administrative incompetence into every nook and cranny of public life, I do not think that there is any prospect of that. Now that's interesting. Open space and high taxes, but good services are appealing. Not to Americans who think taxes and government are evil, but this Brit seems to be okay with that. What about all the turmoil over there with the Muslim population and unemployment and anger and all that? France has social problems that are nearly as great as ours. Although one looks in vain in the centre of Paris or other cities for the brutal and brutalised faces that one sees everywhere in Britain, and that are now the defining national characteristic of the British, France has a substantial underclass too. Whether by accident or design, France has opted for the South African solution to the problem: geographical isolation. It confines its underclass in satellite cities around major conurbations that can be sealed off by a single tank and by halting a few trains. If push ever came to shove, and there was a social explosion, I have little doubt that the Declaration of the Rights of Man would have little influence on the French official response. As the South Africans used to say before they discovered morality, 'They will only foul their own nest.' And certainly such an explosion is not impossible: I recently visited the housing estates that ring Paris, and the alienation and hatred I found there exceeded by far anything I have ever encountered in this country. It was extremely frightening. Wait! He just compared France to South Africa under Apartheid. And he said France was "frightening." It seems to me there ought to be something to counterbalance the sort of fascism he implies. Well, he argues for civilization and politeness. But, for all that, France still seems to me a more civilised country than Britain. It is less dominated by mass distraction (known here as popular culture, but in Nineteen Eighty-Four as prolefeed) than Britain is. France's mass distraction is amateurishly produced in comparison with the cynical slickness of its AngloAmerican equivalent, and this really is a case of the worse the better. There are no tabloid newspapers in France to compare with ours, and while the word 'Anglo-Saxon' in Le Monde, Libération and Le Figaro carries a burden of ideological disapproval and even subtle insult (it means, among other things, savage economic liberalism), there is nothing to compare with the vulgar ignorant abuse of the French to be found in our red-top newspapers, produced for the masses by people who ought to (and in fact do) know better. French newspaper readership is the lowest in the Western world, and while I suppose it is possible to discuss whether this is a good or a bad thing, I personally find it a relief. There is as yet among the young of France no cult of mass public drunkenness, as there is in Britain, no ideological triumph of vulgarity that subdues the political elite into insincere, but nevertheless damaging, acquiescence, as in Britain. There is still a residue of respect for high culture in France. Not long ago, I went to an exhibition in Paris of Ecuadorean baroque religious sculpture, and discovered that the introduction to the catalogue was written by none other than Jacques Chirac (or at least he had appended his name thereto). Would Mr Blair dare do such a thing? In France, an association with Ecuadorean baroque sculpture would only improve - admittedly to a small extent - the President's political standing; in Britain, it would harm the Prime Minister's image, and cast damaging doubts upon his sexuality. Perhaps this fellow idealizes the situation. Perhaps. One should read all the graffiti on all the walls in Paris. The "residue of respect for high culture" is thin... very thin. Well, the author knows this high culture stuff is posing and posturing. But he prefers at least "phony cultivation" to Blair and Bush chomping on fried pork rinds in Texas at the ranch while discussing the Bush dogs. Is it better to have phoney cultivation in charge than militant philistinism? (Does anyone really believe the disgraceful old cynic Mr Chirac, and could anyone not laugh when he writes of these admittedly beautiful works, 'The marvellous sculptures gathered here, works of anonymous artists or artists with entries in the great book of History such as Bernardo de Legarda and Manuel Chili "Caspicara", move us by their humanity, their tenderness, the extreme softness of their expression?) No doubt the philistinism of Mr Blair is entirely sincere, unlike his other shifting passions, but for myself I prefer phoney cultivation. If hypocrisy is the tribute that vice pays to virtue, an insight we owe to that great dissector of the human soul, the French writer of maxims, La Rochefoucauld, then phoney cultivation is the tribute that barbarism pays to civilisation. But at least it knows what civilisation is, knowledge that has been lacking among British government ministers for quite a long time. Well, quoting La Rochefoucauld doesn't exactly make you friends. But he should know, we on this side of the pond, have a president who revels in his contempt for "cultivation." We honor cowboys who have read nothing, and know nothing, but are silent "doers" of honorable deeds. Bush is close enough, it seems, for most folks here. The English, so another Frenchman once observed, take their pleasures sadly. If only that were so: those were the good old days. It used to be the case that you realised the futility of life when you watched the English enjoying themselves, but now it is far worse and more depressing than that; they take their pleasures noisily, offensively, brutally, antisocially. They can't enjoy themselves without screaming, baring their teeth, hitting each other over the head with broken bottles, eructating and vomiting. You see none of this in France, at least on a mass scale, which is what counts in determining the quality of life. Well, the question of the French sense of humor has been discussed on this site. See this from Sunday, 21 December 2003, Jerry Lewis, Monty Python and « Le Père Noël est une Ordure » for a discussion of British, French and American humor. The jury is still out. But yes, the French are, generally, polite and formal, and I have discussed with my friend LC, working now in Pairs, and Kevin, recently returned. It is different there. And this Brit knows it. ... I doubt that many French patients address their doctor by the equivalent of 'mate', as young British patients now do. The mere usage of Madame and Monsieur makes France a more polite country than Britain, despite its (in my experience undeserved) reputation for rudeness. So how do you make a decision to chuck it all and move to France? You try to be realistic. Of course, everything is going to the dogs in France as well as in Britain - at my age, you can expect nothing else; such expectations are genetically hard-wired into the aging human brain - but more slowly and gracefully. The charm of France will see me out, but their education system is falling to bits, their educationists are making the same wicked mistakes as our own, young Frenchmen can't write or spell their own language properly, and crime is rising, so that the statistics, always doubtful, suggest that their crime rate is 80 per cent of ours - that is to say abominably high. Administrative incompetence, indifference and cruelty are not confined to this side of the Channel: for example, not long ago I read a book by a prison doctor in France which, if a true reflection of what goes on in Pariss largest prison, La Sante, puts all prison abuses in Britain in the shade. And yet there is more to a civilisation than the sum of its problems - at least, if it has any charms. Try as I might, however, I can see little charm to life in Britain, even if its vaunted economic recovery were not, as it clearly is, a house of cards. The British strike me as frivolous without gaiety and earnest without seriousness, which is why Mr Blair is so apt a leader for them. ... I am not starry-eyed about France, and I know that it has many skeletons in its cupboard (the latest to emerge is the treatment of the Harkis, the Algerians who sided with the French during the war of independence and moved to France when it was over). But the fact is the French are a great nation, and they have contributed disproportionately to every field of higher human endeavour, from mathematics to literature, from art to physics and medicine. Much more than the British, they retain a respect for the civilisation they have wrought, and if at times their pride is irritating and absurd, and Paris is not the centre of the world because nowhere is the centre of the world, it is better than the loss of spirit one sees in Britain, whose self-doubt is an ideological pretext for mental laziness and excruciating bad taste. Okay, now we see. This fellow is just an overeducated elitist! And a grumpy one at that! Well, he does admit it. But he adds that there are others are like him, but "fear of appearing elitist in this country is now greater than any desire to preserve civilization." The French are some years behind us in the race to cultural oblivion. No doubt they will catch up with us in the end, but I hope not to see it in my rural fastness. For the moment, they still order things better there. Perhaps he will follow up with an article in a year's time recanting this all. Since I am toying with the idea of doing what he is doing, I will watch for that. The Spectator, where this appeared, is a publication of the Hollinger Group, owned now, but perhaps not by the time you read this, by the ex-Canadian conservative apologist Conrad Black. Check the business pages. For background see, from Monday, 22 December 2003 in the weblog, Follow-Up: Smelling a rat early Lord Black and his pearl. And France isn't that pretty really. Here's a shot I took in the middle of winter, looking south across the Post des Arts in Paris. Yep that's the L'Institute de France (23, quai de Conti). 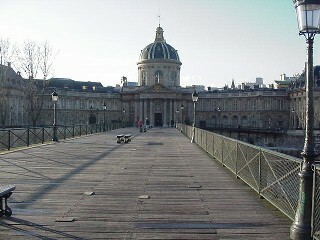 There you will find the famous Académie Française (set up in 1635), the Académie des Inscriptions et Belles-Lettres (1663), the Académie des Sciences (1666), the Académie des Beaux-Arts (union in 1816 of the Académie de Peinture et de Sculpture founded in 1648 and of the Académie d'Architecture founded by Colbert in 1671), and finally the Académie des Sciences morales et politiques (founded in 1795, abolished in 1803 and reinstated in 1832). Yep, this is where the "immortals" meet and make the rules for the French language that no one much cares about any longer. A gray place. "One of Cartier-Bresson's best-known pictures portrays writer and philosopher Jean-Paul Sartre, bundled in an overcoat against the cold, standing on a bridge, lost in thought and looking out past and beyond the photographer. 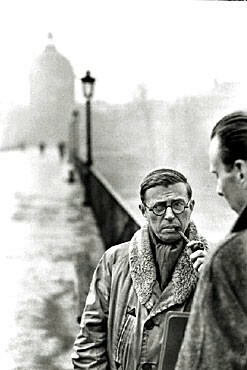 It is through this one photograph that most of the world knows Sartre. He is clearly in conversation with another man, visible on the right edge of the image. One feels the weight of their thoughts, but it is the sense of silence, the lack of any imagined sound, that shrouds this image in mystery. Its representation of this void, a visual translation of 'silence,' is right on the surface. "Made in 1946, this photograph is less about Sartre's personality than it is about his ideas. As a leading proponent of existential philosophy, he proposed that people are free and responsible for their actions, and that human suffering ultimately stems from this responsibility. Cartier-Bresson's portrait is indistinct, the image filtered by its thick, grainy surface; it is a picture of a man absorbed by his environment. Its narrow depth of field - only the main subject is in sharp focus - forces the eye to penetrate this veneer, to rest on the philosopher's face, to gaze into his eyes. He does not return the glance. However, the bridge itself invites us on, a vague diagonal line pointing the way across into a foggy background. It looks like we are walking into a Surrealist painting by Giorgio de Chirico or an image from a poem by Andre Breton, where unconscious connections to this vague photographic landscape are heightened by fragments of Sartre's categorical thought." - Philip Brookman in the Washington Post. Philip Brookman is curator of photography and media arts at the Corcoran Gallery of Art. "Tête à Tête: Portraits by Henri Cartier-Bresson" was at the National Portrait Gallery from October 29, 1999, to January 9, 2000, after which the Gallery closed for three years for renovation.